I have tried adding more folders several ways. 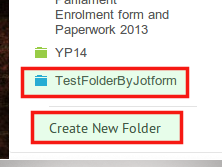 The 'Create one now' button is not shown under the 'My folders' tab as shown in the user guide. I have attempted to add a folder by selecting a form and clicking folders and adding a folder that way but again no success. 1. Clear out your browser cache, then try adding the folder...then..